See all of Las Vegas' famous sites such as the Welcome to Las Vegas sign, the world's largest chocolate fountain, filming locations of hit reality television shows and more on this 4-hour scooter tour. Hotel pickup and drop-off and delicious food from local favorites is included. 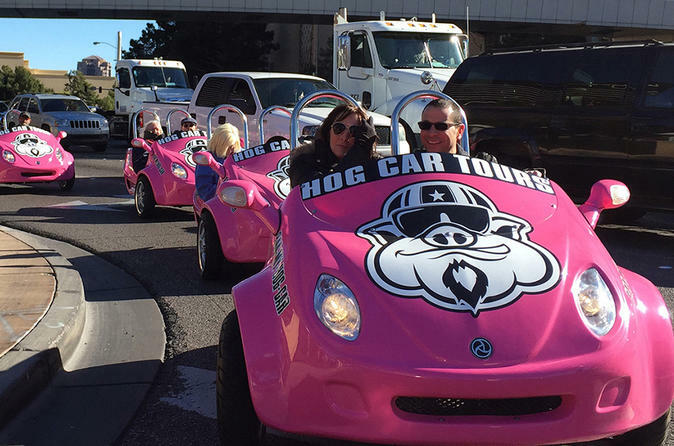 This tour provides an exciting, laugh-out-loud experience visiting and exploring famous Las Vegas landmarks while eating at award winning, local favorite restaurants. The 4-hour all inclusive service starts the minute you are picked-up from your Las Vegas hotel. You'll be brought to the starting location for an overview of how to operate your scooter in a fun and safe manner. Once everyone in your group is comfortable you'll head out for an adventurous day on the Las Vegas Strip. The first stop serves up a delectable sampling of gourmet treats to fill your belly and give you all the energy you need to be ready for the day. You'll drive south on Las Vegas Boulevard, stopping to take photos at the iconic 'Welcome to Las Vegas' sign before making a stop at The Bellagio to see the botanical garden, Chihuly “Fiori di Como” glass sculpture exhibit and the world's tallest chocolate fountain. You'll then travel north up the Strip past the Venetian, Palazzo and the Wynn as crowds of people make you feel like a celebrity when they smile, honk, wave and take pictures and videos of you en route to the Gold and Silver Pawn Shop where the television personalities of History Channel's Pawn Stars work. Depending on the day, you may even meet Chum Lee or The Old Man. Hopping back in your Hog Car scooter, you'll then ride through Downtown Las Vegas where you'll see many of the historic casinos and neon signs. You'll continue to meander through the Fremont area, the Art District and down past Counts Kustoms, also of History Channel fame, and over to Welder Up from the Discovery Channel's Vegas Rat Rods to see an amazing collection of custom made vehicles by Steve Darnell. Getting back in your Hog Car scooter, head to your last food stop, which has been featured on the Travel Channel's Food Paradise TV Show. Here, you will fill-up on 'stick to your ribs,' mouth-watering food picked out by brand ambassador, UFC heavyweight and mixed martial artist, Roy “Big Country” Nelson. To cap off your amazing day, you'll board your scooter for a ride to your final stop at the Rio Hotel and Casino, where you will travel to the top floor as a VIP of the hotel via a glass elevator for some of the most amazing views of Las Vegas. You will stand in awe looking down over all of Las Vegas where you can simply take it all in. For those of you looking for a final blast of adventure you can zoom down the VooDoo Zipline (not included in cost). You won't believe you how much you can fit in a day. Please note: Price displayed is based per scooter and there is a maximum of two (2) passengers per scooter. If you have more than 2 passengers, you will need to book additional scooters. There is a maximum of seven (7) scooters per tour.